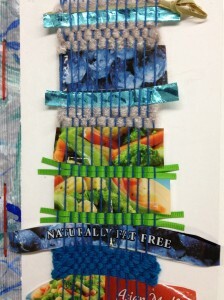 Fruit & Veggies woven collage from frozen veggie bags. 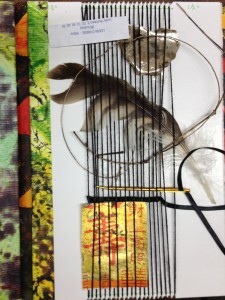 The Weave-A-Journal class at Pullen Art Center ended with the most innovative woven designs. 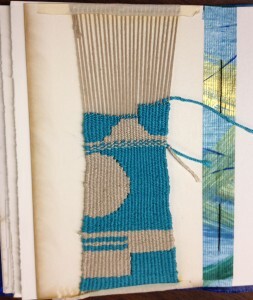 Here are several of the weavings from our class. 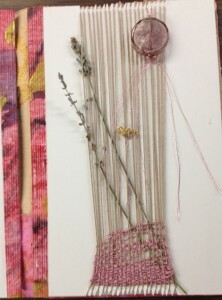 The class included making the book with a wrap-around cover and loom pages. 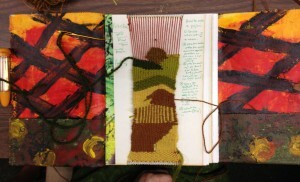 After our book was constructed we spent three weeks weaving. 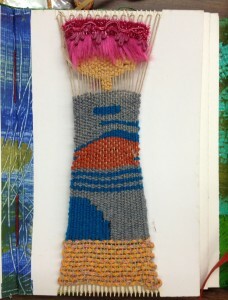 We started with basic tapestry techniques using yarn: Meet & Separate, pick & pick, and the pig tail to hide the end of the yarn. The following week, our weaving became more relaxed using eccentric weaving techniques to get interesting curves, but also soumak for line drawings and rya knots for texture. For our final class, everyone was encouraged to bring any knick-knack, papers, feathers…anything that could be woven into a collage. The results were varied and really turned into great compositions. 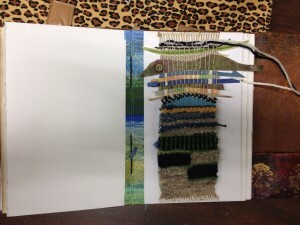 The woven collage is another kind of journaling or free-form expression that has traditionally been relegated to writing or drawing.